Jan 13, 2017 ~ I just love Anahuac National Wildlife Refuge. We have been once already this month and made seven trips last year. It is especially nice in the winter. I know from Facebook that a lot of locals are making trips over to see the famous Burrowing Owl. He was gone for a while but came back earlier this month. I told you about him last year in the February 2016 Short Stories adventure. Burrowing Owls are in parts of Texas year round, but to find one east of Houston is very unusual. I don't know if this guy migrates to the central plains to breed or what. We were so excited by the news he had returned we drove straight down to Frozen Point to check him out first. If you want to make a trip to see him, drive past the Nature Center and do not turn right to do the Auto Tour around Shoveler Pond. Follow the road straight ahead and you will see a sign that says "Frozen Point 5 miles". Keep on that road until you get to the Bay and start counting parking lots. Pull into the third one and check out the cow lot across the road. But there are a lot of birds along the way. Several friends have seen Merlins and even Peregrine Falcons perched on the fence posts, so we were excited to find one. He was on Bill Maroldo's side, so he got photos of him eating the grasshopper and all I got was the leavings. Our rule is the closest gets the first shots, THEN the other can carefully and quietly exit the vehicle and try their luck. I did manage to get out and snap a few before he flew off. My shots as he flew off were not good enough to post. I need more practice. This little Eastern Phoebe was on his side as well, but I managed to take this over his shoulder. I used to do that a lot when I was shooting the Sony 70-400 G2 but got out of the habit while using the monster Sony 500mm. I can hand-hold my new Nikon 500mm so I need to remember this option. Burrowing Owl is about the same size as an American Robin but fatter. We finally got down to the cow lot where the little Burrowing Owl hangs out This guy doesn't understand FAME! He is really shy and you may make the long trip only to rewarded with a tiny glimpse of the top of his head. He is so tiny you might think you are looking at a small rock. Sometimes there are several photographers all tripodded-up at the fence waiting for him to come out. Usually he doesn't. We were alone this time, but decided to come back later and see if we could sneak up on him. Once before we found Pipits scurrying around the cow lot, but this time a couple of Killdeers were out. They would walk and tap the ground with one foot, then the other. You can see the last of a bright orange worm he has found. 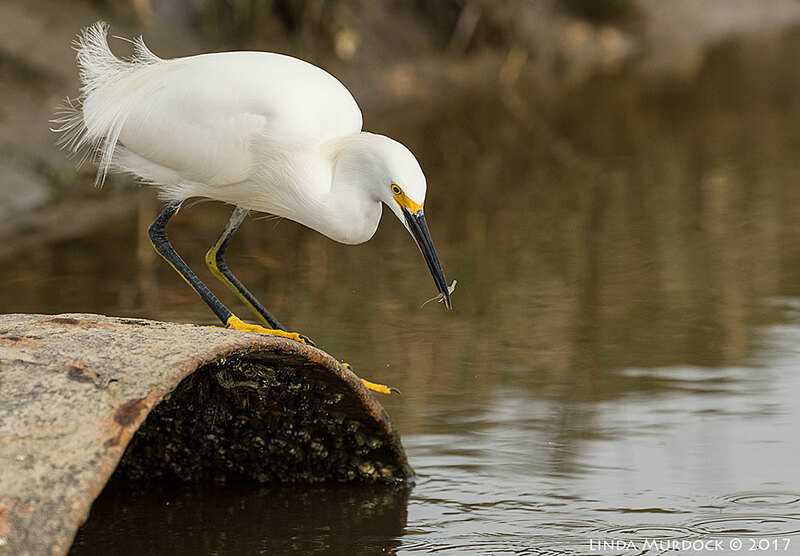 The behavior looked a lot like how the Snowy Egrets use one yellow foot to stir up prey in the shallow water. Do the worms come to the surface because of vibrations? Do other birds do this? Chris Cunningham, have you seen this before in Killdeers or other species? We headed back to the road around the canal locks to see what else was out. Bill got some shots of a big hawk on a low fence post but I missed the whole thing. Neoptropic Cormorants hang out in the canals and just as we drove up this one was struggling with a catfish. Those fins and barbs can be dangerous so they take their time getting it turned just the right way. Here is another posed on the locks. I confess, he was with some mates on the lock. It is almost impossible to get four birds in a row all in focus; believe me, I tried. So, instead I decided he needed solo star presentation and got rid of them with Content Aware in Photoshop. Why I shot that at ISO 2000 I have no idea. Probably leftover settings from when I was trying to get them all in focus at f/9 and even f/10. Down at the end of the road to the boat ramp we found a young Snowy Egret fishing off the culvert. You can tell he is a young bird by the yellow stripes up the back of his legs. He was successful, getting small fish and shrimp. Bill was in the truck shooting out of the window, I had propped my camera and lens on a bean bag at the corner of the truck bed. At that time I hadn't purchased a lens plate to attach to the lens foot so I couldn't use my tripod with the new Nikon rig. But, you learn to improvise since a lot of times you don't have time to set up the tripod. And this is why you take 63 photos of the same bird, doing the same thing until he flies away. I got several good splash photos but I liked this perfect circle one the best. And besides, I need the practice with the new camera. The sun was coming in and out of the clouds so I changed settings frequently, something I need to learn to do on auto-pilot. My fingers are still hunting for the buttons and dials. We chased a Great Blue Heron down the length of the canal heading back out. He would fly a short distance and stop. Rinse, lather, repeat. Geez, the bird is BIG and SLOW but I had no success. Even though the birds were flying AWAY from us (which is the least desirable image) I kept trying just for practice. The new camera and lens weigh a bit over 9 lbs and lifting and holding it up over and over is pretty tough, y'all. We went around Shoveler Pond and I didn't get any keepers. There is more traffic on that Auto-loop and quite a few fishermen. After a while we decided to go back and check on the owl even though it was 5:30 pm. Burrowing Owl balanced on one foot. We got to the end of Frozen Point and the owl was OUT! It was 6:12 pm when I took this photo. Bill carefully walked up with his tripod and I kept hidden behind him as we navigated the high weeds next to the fence. He must have been aware of us, but he didn't move. I had my long lens braced on the barbed-wire and took about 30 shots. He had his eyes closed in a lot of them but you could barely see him as it was so dark. With the Nikon, you can display the images you have just taken on the LCD monitor and zoom in but what good does that do if your glasses are in the truck? And it was took dark to see anyway? I do miss the EVF in the Sony (you can chimp the shot you just took in the viewfinder and it is bright and clear) BUT I would never have gotten the shot with the Sony. That is ISO 3200 y'all; ISO 1250 was just about the maximum for the Sony. We took a few sunset photos and cursed the fact we didn't bring wide-angle lenses on this trip. By then it was almost 6:30 pm and really dark. The dirt roads are full of pot-holes and surprises but we made it back to pavement and could see the blinking red stop sign at the Nature Center in the distance when.... we heard a literal symphony of COYOTES. There had to be a dozen or more off to the east. I have never seen any coyotes in the Refuge, but not at all surprised know they are there. Have you been to Anahuac lately? Have you seen the little owl? And, have you ever seen a coyote there? Let me know in the comments below!